The artificial sweeteners in diet soda overwhelm your taste buds with an onslaught of sweetness. Aspartame ranks 200 times sweeter than table sugar. In fact, brain scans show that diet soda alters sweet receptors in the brain and prolongs sugar cravings rather than satisfies them. A lot of studies have shown that artificial sweeteners trick the brain into thinking that more calories are consumed, but when the calories don’t come, it affects metabolism and appetite regulation. Overconsumption of other foods/beverages may also occur in conjunction with diet beverage consumption owing to overestimation of the number of calories saved by substituting diet beverages for sugar-sweetened beverages. Often people consuming diet soda made poor food choices like a burger , fries or potato chips or a piece of cake because they think they can afford extra calories. Sometimes these poor choices are built into habits. Research has shown that over the course of time, diet soda drinkers increase in their waist circumference compared to non-drinkers. Diet Soda is of no nutritional value. When consuming diet soda you are not taking any calories but you are also not swallowing anything good to your body. Artificial sweeteners in beverages increase the desire for sugar-sweetened, energy-dense beverages/foods disrupting consumers’ ability to accurately estimate energy intake and remaining energy needs. 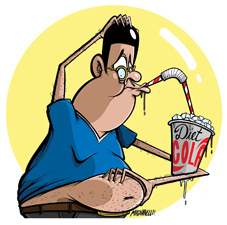 Thus, diet soda consumption may result in overconsumption, increased body weight, and consequent metabolic dysfunction. What should I drink then? You can replace diet soda with following drinks: Water, Green Tea, Fresh Lime juice. How do I wean myself from Diet Soda? Cut back gradually: If you typically drink multiple servings of soda a day, Sacks suggests first cutting back to one a day. Give that two weeks, then switch to three sodas a week. Mix it with Water: Drink Half-Soda, Half-water. It cuts back on the sweetness of the soda making it less addictive. Drink glass of water first: Whenever the urge to drink a soda hits, fill up a big glass of ice water and finish that first. Chances are your thirst will be quenched and you’ll feel satisfied from just the water. you could also class up your water. Make it more palatable with the addition of some fruit or natural flavors. Adding lemon, orange, mint or cucumber slices to a pitcher of water in your refrigerator, can serve as a detour when you go hunting for a cold soda. Saving Diet sodas for only special occasions just like any other junk food could help you break your regular soda habit. Understanding that soda is all sugar and artificial flavourings can help you make a healthy choice. Posted on November 3, 2015 November 3, 2015 by anupama2012Posted in UncategorizedTagged colas, soda, unhealthy, weight gain. Next Next post: What is disordered eating?